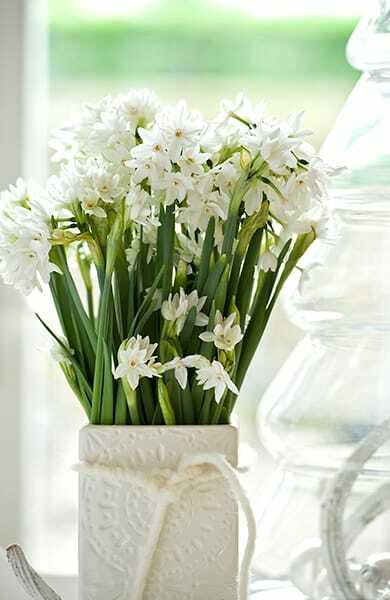 Sparkling paperwhites – you can have them for the holidays. 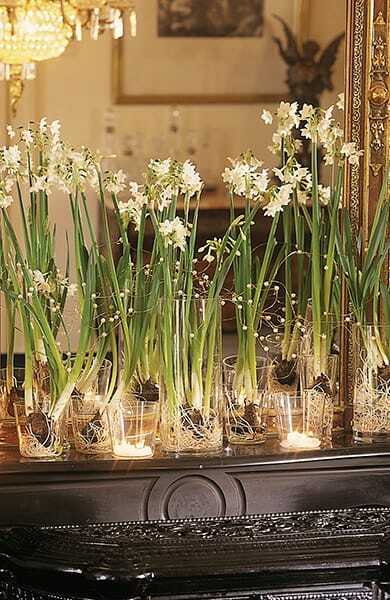 It only takes a few minutes to arrange and force a few bulbs. They’re incredibly easy to grow. Within 4-6 weeks from planting you’ll enjoy clusters of snowy white flowers with a sweet uplifting fragrance. Make any room bright and beautiful with these classic indoor blooms. Grow them in a decorative glass container of your choosing without drainage holes among white river stones, sand, glass beads or decorative terra cotta pellets. Getting creative with their presentation and experimenting with unique and unusual vases, jars, dishes and crocks is simply fun. Paperwhites suit any style from formal to contemporary. Shallow containers work just as well as tall vases, as the bulbs need only 8 cm (3”) of depth to root. Clear glass containers let you see the roots and stems develop while the starry blooms rise above. Once you’ve found your container, evenly fill the bottom with 5-8 cm (2-3”) of your choice of stones. Remove the outermost papery wrapper from around the bulbs. Then nestle each bulb root side down in amongst the stones so that they are shoulder to shoulder, but not quite touching. The bulbs will anchor into place once the roots start growing in and around the stones. Fill the container with water until it is just below the paperwhites. In general, bulbs don’t like to “sit” in water, so keep the bulbs dry, just above the water level. Bulbs can sense the presence of the water below and will sprout roots down into it. Paperwhites don’t require a cooling period and soon signs of growth will appear. Place the arrangement in a room with lots of bright indirect light and watch the progress daily. When you see flower buds, the sweet scent of paperwhites will soon freshen the house. Plan ahead for continuous displays and special gatherings. Keep paperwhite bulbs on hand in a cool dark place and force them at 2-4 week intervals or when you’re ready for blooms. Just add water and a bright location. Did you know there is more than one kind of paperwhite to explore? If the sweet, musky scent of Paperwhite Ziva is not your favourite, discover the delicate spice and citrus aroma of Chinese Sacred Lily, or the faint scent of Inbal. Ask for these varieties at your local garden centre. 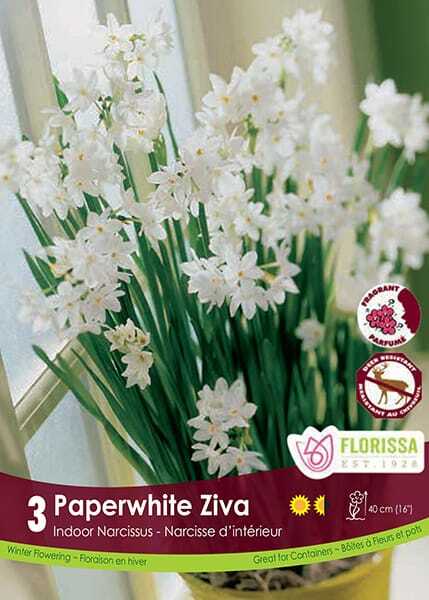 Paperwhite Ziva is among the most widely available and popular bulbs for indoor forcing with large clusters of pure white and sweet, musk scented flowers. Blooms appear within 3-4 weeks. 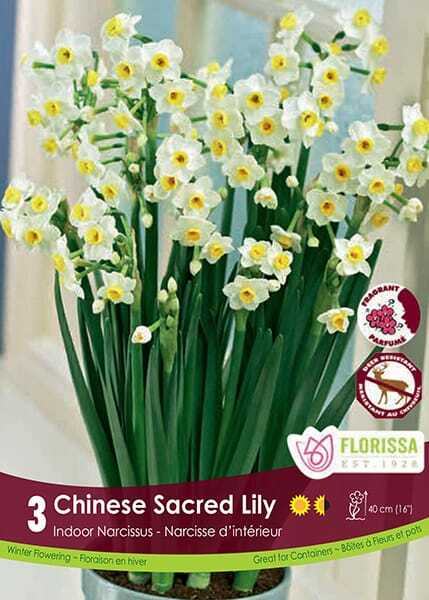 Chinese Sacred Lily has long been associated with Chinese New Year Celebrations. Each stem bears 5-10 soft white flowers with orange yellow centers. The delicate fragrance is of honey, clove, and citrus; not musky like other paperwhites. Blooms appear within 3-5 weeks. 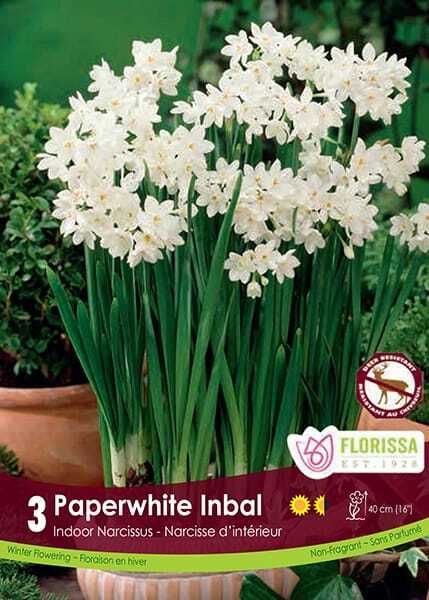 Inbal offers all the beauty of paperwhites without the intense fragrance of Paperwhite Ziva. The fragrance is faint, so much so, that many consider this variety odorless. The stems are more robust too. Blooms appear within 3-4 weeks.